Hello, Friends of Jennie Drake Park! Thank you for your vote and for encouraging others to vote for me. Some of you have inquired about the outcome of the competition. 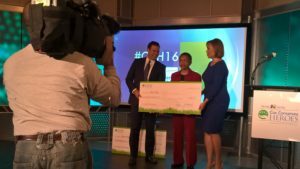 The Cox Conserves Hero for 2016 was announced on November 15. No, the Jennie Drake Park was not the top vote-getter. Nevertheless, we are still a winner, as we will receive $5,000 for the park. The winner among the three finalists was Linda Cotten Taylor, Chapel Hill Park (DeKalb County); her park will receive an additional $5,000. We will appreciate your continued support of the Jennie Drake Park. We have regular park work sessions (most 3rd Saturdays from 9 AM to noon). We hope you will be able to join us for a work session. Our next work session will be in January–Monday, January 16 (Martin Luther King Jr. Day). from 9 AM to noon. We also raise money in order to make improvements in the park. If you would like to know more about how you can volunteer or make a tax-deductible financial contribution, just let me know. Call me or visit our website: www.jenniedrakepark.org. This entry was posted in Updates on January 2, 2017 by admin.